(TibetanReview.net, May26, 2018) – A special NIA (National Investigation Agency) court in Bihar’s capital Patna has on May 25 convicted five Indian Mujahideen militants for the Jul 7, 2013 Bodh Gaya serial blasts case in which several people were injured. The court has found all the five accused — Imtiyaz Ansari, Haider Ali, Mujib Ullah, Omair Siddiqui and Azharuddin Qureishi — guilty under various sections of the Indian Penal Code, Unlawful Activity (Prevention) Act and the Explosives Act. The court has fixed May 31 for sentencing the guilty. A sixth accused – Taufiq Ahmed –being less than 18 at the time of the attack, was sentenced to three years in remand home by a juvenile court last year, which found him guilty of involvement in the case. On Jul 7, 2013 a series of ten bombs exploded in and around the Mahabodhi Temple complex, a UNESCO World Heritage Site in Bodh Gaya, India, within a span of 30 minutes beginning 5:30 am. Five people, including two Buddhist monks, were injured. 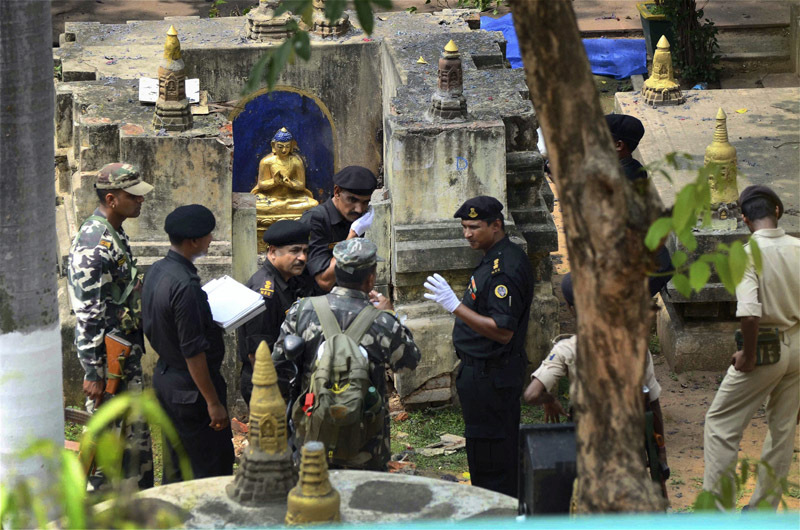 Three other devices were defused by bomb-disposal squads at a number of locations in Gaya. A small bomb exploded at an 80-foot (24 m) statue of the Buddha while three others exploded at the Tergar Tibetan monastery. The temple itself and the Bodhi Tree (where Gautama Buddha is believed to have attained enlightenment) were undamaged. The explosions took place in concurrence with the Sutta chanting and meditation which begin the daily routine of the mahavihara. During the trial, statements were recorded of as many as 90 witnesses. The blasts were stated to have been carried out to avenge alleged atrocities on Rohingya Muslims in Myanmar by the Buddhist majority in that country.